The fabulous true story of the repentant French jailbird who became the world's first detective. Paris has many claims to distinction. Not the least is the fact that in that city a contrite crook organized the first detective bureau in the world. Set up in 1817, the original Brigade de Sûreté was unlike any law-enforcement enforcement body before or since. Each of its 28 social agents was an ex-criminal who was required to wear gloves so he would not accused of picking pockets while on duty. The commander of the Brigade had served time in nearly every important prison in France. He had engineering no less than 21 jail breaks, and at the time he experienced a change of heart was known as one of the cleverest felons in Europe. Francois Eugene Vidocq always claimed that his first major conviction was the result of a frame-up. It all started when he deserted from the army and found himself in the strange city of Lille with several months’ pay in his pocket. Though only 18, he knew his way around. His good looks — plus the gold coins in his pockets — soon won the heart of a black-eyed girl named Francine. But Vidocq had a rival in a captain of engineer. When Vidocq tried to drive off the competition by beating him up, he was arrested and sentenced to 90 days for disorderly conduct. Jailers of the period were permitted to assign private rooms to prisoners who could pay for the privilege. At the Tower of Saint Peter, Vidocq secured the best the place afforded. A trio of less fortunate inmates begged him to permit them the use of his room a few hours a day, and he foolishly consented. His new friends wanted privacy in order to forge a release order for one of their number. Vidocq later insisted that he knew nothing of what was going on, but when the plot was uncovered the forgers named him as an accomplice. His protestations of innocence went unheeded. So he decided to escape before sentence could be passed. It was obvious that if brought to trial, things would go against him. Besides, he wanted to see Francine again. Dozens of prisoners had already tried to break out of St. Peter’s. Some had overpowered guards. Others had sawed bars and dug tunnels. But in twenty years, not a man had gained freedom — and four had been killed in attempting a getaway. Vidocq saw that he couldn’t hope to escape by force. He studied the situation and discovered that a military surgeon visited the prison twice each week. Francine came in nearly every day and, bit by bit, smuggled a uniform to Vidocq. He practiced the gestures and speech of the doctor until he could imitate them perfectly. Then he put his disguise on and boldly walked past three turnkeys, out the front gate. A few hours later he was strolling along the principal street when a gendarme recognized him. Vidocq surrendered without struggle, even bought his captor a glass of rum in a nearby saloon. On the way back to prison they chatted like old friends until an empty street was reached. Prepared for just such an opportunity, Vidocq took a handful of ashes from his pocket, threw them in the officers face and took to his heels. There followed a fantastic series of re-captures and escapes. Vidocq could never resist a pretty face, and time after time he was trapped when visiting Francine, or Elisa, or Coco. Each new arrest was followed by an escape. Once he spent 55 nights digging a tunnel. At Bicetre, he disguised himself as a nun and sauntered out of the prison hospital, pausing at the door to chat with a guard. Again, he discovered that a particular dungeon was equipped with locks which could be opened with a master key. He studied the shape of the key, made a model out of a carrot and shaped a mold from bread. Then, using pork fat for fuel, he melted his tin spoon and poured it into the mold. The first casting was a failure, but on the second attempt Vidocq produced a perfect master key. Between sessions in jail, he was involved in one crime after another. Hoping to throw off pursuit, he took the name of a sailor whom he knew to be dead. His disguise deceived the father of the youth. But even as August Duval he was not free of trouble — the dead man had been wanted for desertion from the navy. Arrested, “Duval” was placed in custody of an officer who recognized him, so Vidocq resumed his own identity. This time he was shipped to Brest, under sentence of eight years in the galleys. En route to the prison ship, Vidocq sawed off his chains and escaped. He determined to go straight, so found a pretty milliner and persuaded her to take him for a partner. But a former jail-mate recognized him and turned him in to the authorities. Another escape and a second attempt to lead an honest life met the same ill-luck. Now the best-known rogue in France, in 1809 Vidocq realized that the only way to make up for the past was to join forces with law and order. He offered to serve as a spy on his former associates, in return for release from La Force Prison and a full pardon. Authorities indignantly refused the proposition. But a few weeks later, Paris suffered a wave of spectacular robberies. The gendarmes were completely baffled, and in desperation the police commissioner turned to Vidocq. Without leaving his cell, he gathered information that broke the case. His fellow prisoners would have murdered him had they suspected his new connection, so Vidocq staged another escape — this time with the cooperation of his jailers. For months, he acted as a stool pigeon. Eventually, however, the underworld learned that he was in the pay of the police. So he dropped the pretense and became a professional detective — first in the world. Police work in the early 19th century consisted of: (1) preventing crimes, (2) catching law-breakers in the act, and (3) exacting confessions from suspects. Anything remotely like modern detective work was completely unknown. Soon after Vidocq became a full-fledged law-enforcement officer, he was challenged by a particularly brutal murder. A butcher, carrying a considerable sum of money, was knifed in the outskirts of Paris. There were no witnesses, no suspects. In the ordinary course of events, the crime would have been charged to “parties unknown” and the case closed. But the former convict had his own ideas as to how an investigation should be conducted. He took impressions of the footprints at the scene of the crime, collected a button, and even picked up several scraps of blood-stained paper. Two of the bits seemed to have been torn off to wipe the blade of a knife — the murder weapon. A few letters were scribbled on the fragments, but made no sense. Not a gendarme in France would have wasted a second glance on the crumpled scraps. If his deductions were correct, a wine merchant who lived at the Barriere Rochechouart was connected with the case. Before the end of the day, he discovered in that area a shop operated by a shady character who called himself Raoul. Instead of arresting the suspect, Vidocq had the house watched. A well-known highway robber appeared within a few hours, was shadowed to his rooms and arrested. Law did not require that a formal charge be entered, so Vidocq merely hinted to the prisoner. Court, that he was suspected of smuggling. Leaving Court in jail, the detective called on Raoul. He explained that the wine-merchant had been reported as a dealer in immoral literature. Raoul made no protest, even offered to help the friendly officer. Among the papers in his desk was a letter, from which part of the address had been torn. A glance showed it to be the sheet from which the pieces found at the murder scene had come. Raoul noticed Vidocq’s stare and reached for a pistol. But the detective disarmed him and carried him to the prefecture of police. Even though convinced that he had the murderers, Vidocq could not hope to get a conviction on circumstantial evidence — such a thing was unheard of in that day. So he told each of his prisoners that the other had turned state’s evidence. Confronted with this information and the torn letter, Raoul confessed. Court admitted that he was guilty and both died under the guillotine. Not all Vidocq’s cases showed such ingenuity Many of them were routine. Others were clinched by the evidence of paid informers. For a period of two decades, his force of spies and investigators won more than twenty convictions a week. He instituted the police line-up, and devised the first crude file listing data on all felons — the forerunner of the FBI record system. Aside from his colorful personal exploits, Vidocq deserves to be remembered by all true connoisseurs of crime because he was the father of the detective story. In 1829, he published a long account of his own life. All previous literature in the field of crime had glorified the criminal. Vidocq was not at all modest; he made the most of his own feats in the interest of law and order, and was the dashing hero of his own autobiography. 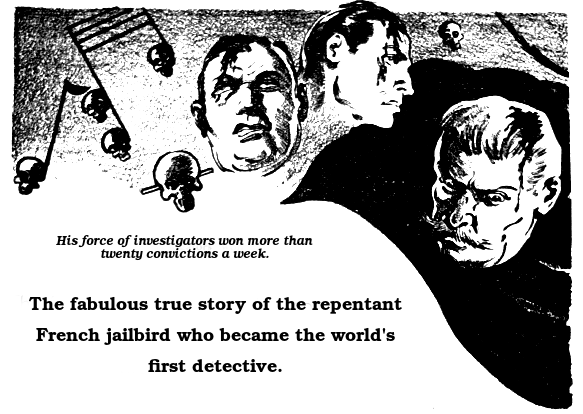 Many noted writers of fiction were influenced by the book, and produced stories in which detectives were the heroes. Victor Hugo, Honore de Balzac, Charles Dickens, Edgar Allan Poe and A. Conan Doyle were among those directly influenced by Vidocq’s story, and the modern detective tale stems from the works of these masters. Super-rogue who regretted his crimes to become a trail-blazer in the field of detection, Francois Vidocq has been overshadowed by modern sleuths as well as gangsters. But the movement that he started produced scientific crime detection, and his own life gave the detective his place as a hero in fiction!